Nicole's Needlework: I'm still here! Woohoo! 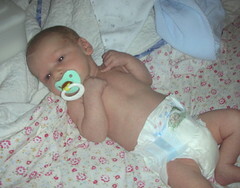 Naked baby pictures! LOL So glad to hear he's doing better! He is sooo cute! 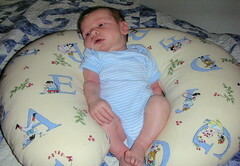 And in that Boppy, he looks almost miniature. Wish I could cuddle that little boy - he's sooooooo cute! Your little boy is just darling! Your pear is looking really pretty! I too got the pear but haven't started it yet. I wondered how the dark gold thread would look and I can see it will be beautiful! I love watching your progress! 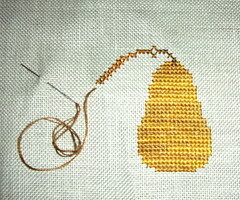 Pear is looking great - do you have plans to do all the LHN/CC thread packs? Any creative ideas of what to do with them when you are done? Your sweet babe is adorable! Like your start on Pear, I'm glad you're finding a little time to stitch! Pear looks great - and so does your little one! Congrats! You are AMAZING. You had a baby, moved states on short notice, blogged about it, took pictures, and even stitched! AND you have 2 other children? And you sound so peaceful and happy! What's your secret? Please share!! !